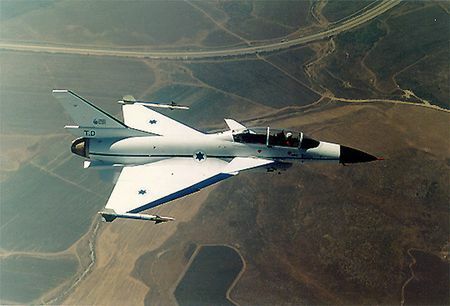 The Lavi — an Israeli-developed fighter aircraft which never made it into production, to a great extent because of US pressure. It’s been over 15 years since PM Netanyahu’s speech to a joint session of Congress stating Israel’s goal of economic independence. In 1997, Israel received $3.1 billion in aid from the U.S. In 2012, Israel was still receiving $3.1 billion annually in U.S. aid. We haven’t made much progress towards PM Netanyahu’s goal. For Israel’s sake, as well as for America’s, it’s time to reduce U.S. annual aid to Israel — to 0 — over some reasonable adjustment period (perhaps 5 to 10 years), leaving open the possibility, of course, for emergency aid. Israel and the United States have increasingly different visions about the future of the Middle East. We shouldn’t subsidize a country (even an ally) that is undermining our policy goals. The U.S. has long-term goals in the Middle East (including avoiding the humanitarian and financial catastrophe of another major war in the region). A major (bipartisan) goal of the United States has been the two-state solution to the Israeli-Palestinian conflict. Israel has legitimate security concerns, and a just peace will not be easy to achieve. However, the current Israeli government is clearly not committed to the U.S. vision, and has done everything possible to sabotage American efforts. Israel’s continued building of random settlements — all over what’s supposed to become the State of Palestine — directly conflicts with American policy goals. In other words, Strauss implies that Israel does not share the goal of avoiding war! That’s the offensive part. And what precisely is it about throwing international law to the winds and forcing Israel back to indefensible 1949 lines that makes it a “major (bipartisan) goal” of the US? It’s just the usual anti-Israel nonsense that we’ve come to expect from academics like Strauss, who is associated with that political whorehouse, Harvard University (not that my alma mater is any better). But this post isn’t about the cynical attempt to destroy the Jewish state and re-disperse the survivors, dressed up as a “solution” to the instability and terrorism whose real cause is the inability of Muslims to tolerate Jewish sovereignty in ‘their’ Middle East. It’s not about how the Obama Administration is aiding and abetting that project. It’s about why Israel needs to forgo the 3.1 billion in aid. This aid is primarily in the form of weapons and systems made in the US, so it is not entirely given out of the goodness of our hearts. But there is no doubt that Israel needs the best weapons systems available, and that its defense forces are built on American systems. Israel, on the other hand, will shortly be coming into its own as a major producer of natural gas and possibly oil, and will be able to buy its own weapons. Will the US sell them? You bet we will — our economy is bad for structural reasons and is not getting better. Thanks to the huge bill for recent wars and the upward spiral of healthcare costs for the aging boomer generation, the US will need Israel’s business. Why should only Arabs get to recycle US petrodollars? Israel needs its independence. It needs to say to the US that it will determine its own policies, and it needs to say “thanks, but no thanks” to American spying installations inside the country. Little by little it needs to develop secondary sources for military technology, despite the unavoidable complexity. It needs to develop its own technology, too, without American interference. Israel also needs to understand that US influence in the Middle East is waning. The administration has announced that it plans to scale back involvement in the Middle East. Concretely, the military budget of the US has been cut and will continue to be cut; the Navy will have fewer ships in the region and of course US troops are gone from Iraq and will soon be gone from Afghanistan. Russian and Iranian power is rising. Israel cannot depend on the US to protect it, and needs to follow its own course. Strauss is correct that US and Israeli policy goals no longer coincide. Israel wants to survive as a Jewish state, and the US — the present administration at least — is pursuing polices with regard to Iran and also the Palestinians which are directly opposed to that. US aid to Israel provides leverage for a hostile administration to control Israel — and in particular to restrain it from acting in self-defense. Time to start cutting the apron-strings. This entry was posted on Monday, November 11th, 2013 at 11:37 am and is filed under General. You can follow any responses to this entry through the RSS 2.0 feed. Both comments and pings are currently closed. The U.S. is supposedly committed to the security of Israel for ideological and moral, as well as practical political reasons. Even the Obama Administration gives a bit more than lip service to this conception through its military aid. There is no presently available substitute for the United States. I therefore do not think that Israel should be seeking to distance itself from the U.S. but rather altering its policy which I admit seems unlikely under the Obama Administration. What I think it should be doing and Prime Minister Netanyahu is doing this to the degree possible is openly contradicting the U.S. perception or rather misperception of what Israel’s interests are. PS Without in any way supporting the U.S. and global criticism of Israeli settlement policy I do not like the way we have been carrying out our settlement policy. Defying the world to build homes for Jews who serve in the Army is one thing. But doing this to build Haredi districts for those who do not, seems to me to be putting narrow political interests over the national well-being. The Prime Minister regrettably has also done this on other issues including those related to the selection of the Chief Rabbis. I do not think Israel should tell Obama to go to hell tomorrow, although I can understand the desire to do so. But I think Israel should begin the divorce process. It is never a good idea to depend on a sole source for anything. In the meantime Israel needs to tell its story to the American people, something it is not doing satisfactorily now.